Wayne, Pa. (December 7, 2017) —Custom-designed processor trays from Dolco Packaging can help meat and poultry processors draw attention to the unique attributes of their products. Product and packaging differentiation has been a sales growth driver for many food categories. However, meat and poultry packaging has not demonstrated the same level of structural innovation found in other categories. Custom-designed processor trays from Dolco Packaging alters that paradigm. Whether you want to promote premium brats or sausages, meat patties, stuffed poultry or exotic meats, Dolco’s in-house designers can create a tray that draws consumer attention to your product’s unique attributes. Examples include compartments/dividers for sausages, deep-draw pockets for meat patties, structural indentations for easy removal and many more. 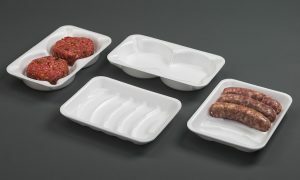 Backed by more than 50 years of manufacturing expertise, Dolco’s proprietary processing technology also produces a foam tray that is thicker than traditional meat trays without using more material. A thicker tray means fewer rewraps. Your operation benefits by having less product waste and lower labor costs. Further, Dolco manufactures processor-grade trays exclusively. That means there are no changeover issues causing quality variations. Standard trays colors are white, yellow and black to complement a variety of meat and poultry products. Other options are also available.